Crystal clear containers for eyelets, brads and small scrapbooking supplies. Made in America. Our polystyrene container line is perfect for point of purchase packaging of eyelets, brads, and small scrapbooking supplies. These crystal clear containers have a high gloss finish and a straight wall design which allows easy application of labels and foil decals for product branding. 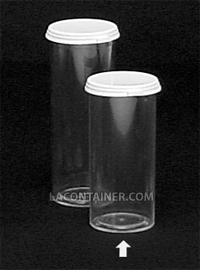 These high quality containers are made in America and are ready to ship usually within 24 hours. 28.6mm Dia. X 66.7mm Ht. 1 1/8" Dia. X 2 5/8" Ht.